Escutcheon of the Aldobrandini family. The Aldobrandini are an Italian noble family from Florence, with close ties to the Vatican. Its Roman fortunes were made when Ippolito Aldobrandini became pope under the name Pope Clement VIII. He arranged the marriage that linked the Aldobrandini with the Roman family of Pamphili. Additionally, they were also linked to marriage alliances with the Farnese (Ranuccio I, duke of Parma, had marriedMargherita Aldobrandini) and Borghese (since Olimpia Aldobrandini married Paolo Borghese). The family also lends its name to the Palazzo Aldobrandini on the Quirinal Hill. The Aldobrandini family, having reached the height of its powers when Ippolito Aldobrandini became Pope Clement VIII (1592-1605), began the building of the villa. In 1600 Clement VIII acquired the Orti Vitelli on the Quirinal hill and in 1601 donated the property to his nephew Cardinal Pietro Aldobrandini. The old buildings of the Vitelli Family were demolished and construction began on the new villa and adjacent garden. The villa was never the family seat as the Aldobrandini family owned even more splendid residences elsewhere in Rome. The villa on the Quirinal hill served essentially for ceremonial functions. 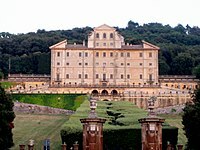 More famous was the Villa Aldobrandini in Frascati. Also known as Belvedere for its charming location overlooking the whole valley up toRome, it was rebuilt on the order of Cardinal Pietro Aldobrandini, Pope Clement VIII's nephew over a pre-existing edifice built by the Vatican prelate Alessandro Rufini in 1550. The villa, aligned with the cathedral down its axial avenue that is continued through the town as Viale Catone, was rebuilt in the current form by Giacomo della Porta from 1598 to 1602, and then completed by Carlo Maderno andGiovanni Fontana. The villa has an imposing 17th -century facade and some other interesting architectural and environmental features, such as the double gallery order on the rear facade, the spiral-shaped flights, the large exedra of the Water Theatre and the magnificent park. Inside there are paintings of Mannerist and Baroque artists such as the Zuccari brothers, Cavalier D'Arpino and Domenichino. Outside there is a monumental gate by Carlo Francesco Bizzaccheri (early 18th century). The Doria, Pamphilj, Landi and Aldobrandini families have become united through marriage and descent under the simplified surname Doria Pamphilj (which is now extinct since the death of Princess Orietta Doria Pamphlij in 2000). The Aldobrandini family palazzo and its collections of works of art and furnishings is now the Doria Pamphilj Gallery in Rome. The family name lives on, however, via a branch of the Borghese family, descended from the marriage of Olimpia Aldobrandini with Prince Paolo Borghese in the 17th century. This line is descended from Don Camillo Borghese, Prince Aldobrandini (1816-1902), a leading member of the soi-disant Black Nobility, who in turn was the younger brother of the then Prince Borghese and head of that family. Princess Olimpia Anna Aldobrandini, also a non-lineal descendent of Napoleon on her mother's side, married into the Rothschild family. The princely family is currently represented by Prince Camillo Aldobrandini (b. 1945), whose heir is Don Clemente Aldobrandini (b. 1982). Alessandro Cardinal Aldobrandini (1667-1734), raised to the cardinalate 1730. Cinzio Passeri Cardinal Aldobrandini, a nephew of Clement VIII, raised to the cardinalate 1593. Pietro Cardinal Aldobrandini (1571-1621), raised to the cardinalate 1593 by Clement VIII. Jump up^ [S37] Charles Mosley, editor, Burke's Peerage, Baronetage & Knightage, 107th edition, 3 volumes (Wilmington, Delaware, U.S.A.: Burke's Peerage (Genealogical Books) Ltd, 2003), volume 3, page 3416. Hereinafter cited as Burke's Peerage and Baronetage, 107th edition. Jump up^ Catholic Hierarchy: "Alessandro Cardinal Aldobrandini"
Jump up^ Catholic Hierarchy: "Pietro Cardinal Aldobrandini"